Unnamed storm in the Gulf will get your attention! 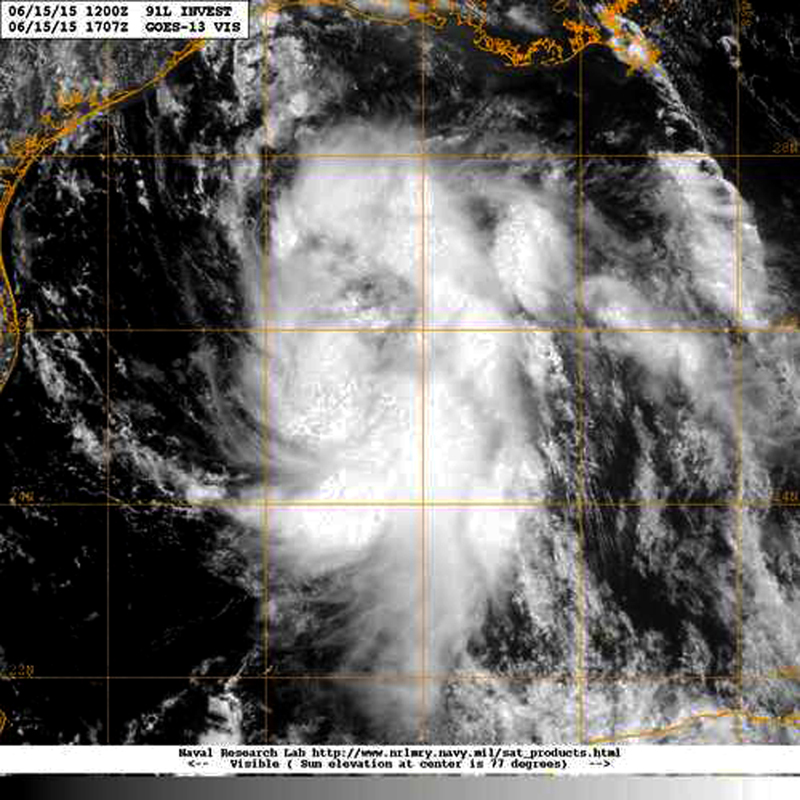 The storm in the central Gulf of Mexico, which the National Hurricane Center has designated as ‘INVEST 91L’ and is monitoring closely, has gotten stronger and much better organized this Monday 15 June, and may be on the verge of becoming BILL the 2nd name tropical cyclone of the 2015 Atlantic Hurricane season. While this system has not yet reached the threshold of tropical cyclone, and remains unnamed for now, it already has the makings of a storm to be remembered as it pushes rain and moisture-laden air from the Gulf over a region of northeastern Mexico, but especially in Texas and western Louisiana that have already seen plenty of rain and flooding in recent days, where the ground remains saturated, with a high potential for additional flooding and damage over the next couple of days. As this is happening, over in the East Pacific CARLOS, now downgraded once again to tropical storm strength, has continued to shift its track toward the east, which will bring it much closer to Puerto Vallarta, Mazatlan and other vulnerable communities in the Pacific coastal region of Mexico. 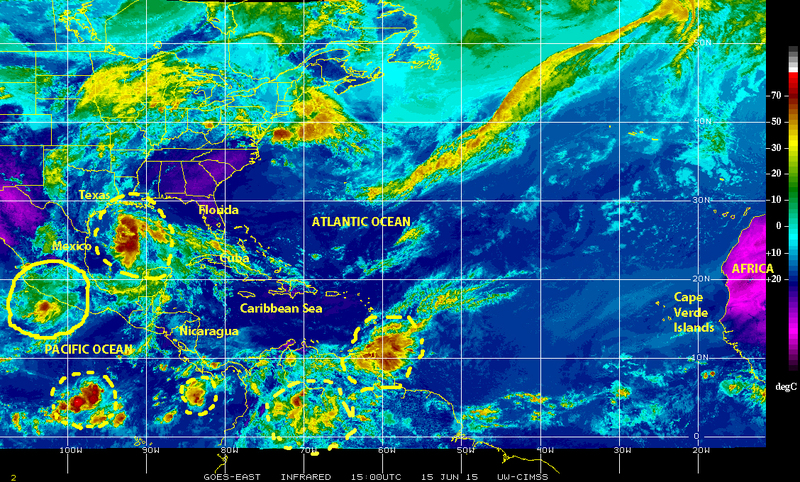 Elsewhere, there are tropical waves and cells of disturbed weather off the Pacific coast of Central America and Panama, over the northern regions of South America, in Colombia and Venezuela. There is also a large glob of stormy weather at the western end of ‘hurricane alley’ fast approaching the windward islands at the entrance to the Caribbean Sea. All of these systems warrant monitoring in coming days as they move over favorable environments of warm surface waters carrying the potential for further development, and for affecting coastal communities throughout a regions where extreme rain events have already caused death and plenty of damage, in recent days. So, there is plenty of weather disturbances from the Gulf states, Mexico and Central America, to northern South America, the Windward Islands, and the adjacent off shore waters in the eastern Pacific, the Gulf and the Caribbean. This is the time where many of the contributors to cyclogenesis come together, so the potential for cyclonic activity is present now and will remain present over the next few months as the advent of summer provides a more favorable ocean-atmosphere environment. We all must remain alert, be prepared, and dedicate ourselves to the practice of hurricane mitigation! Previous PostCarlos reaches hurricane strengthNext PostBILL the 2nd named storm of the 2015 Atlantic Hurricane Season activates in the Gulf!